As a consultant, your website needs to do more than look nice. It’s about demonstrating to potential clients that you’re credible. It’s a tool that can help bring you more leads. Good design is about solving problems, and your website serves you best when it’s designed to solve your problems as a consultant. Acquiring leads is one of the most time-consuming aspects of consulting. Your website, when done right, can be your top lead generator. And best of all, it can generate leads while you’re focused on delivering valuable work for your clients. That said, it’s not easy to get quality leads. How can you use your website to help shoulder this burden? This article gives you 5 simple tools that you can use to get more leads for your consulting business. Using these tools, you can move away from your “brochure website”. These tools make your website effective and help you generate leads around the clock. These tools work with WordPress. I recommend that all consultants use WordPress (with X Theme) as their CMS for their website. 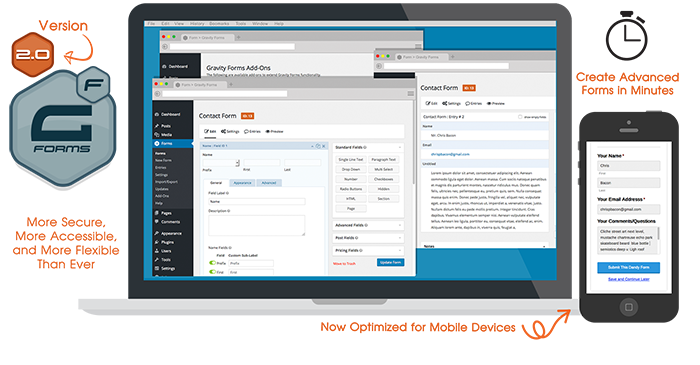 Gravity Forms allows you to create lead generation forms for your website. With Gravity Forms, you can create forms with any type of input information. This helps you get the information you need to get quality leads. To get leads through your website, you need forms. These forms need to match the style and brand of your website to look professional. You can use Gravity Forms to generate leads, schedule appointments, lead qualification, press submissions — anything where you need some sort of information from a visitor. I use Gravity forms for my contact page and my project application page. With premium add-ons, you can even take payments and create monthly subscriptions. 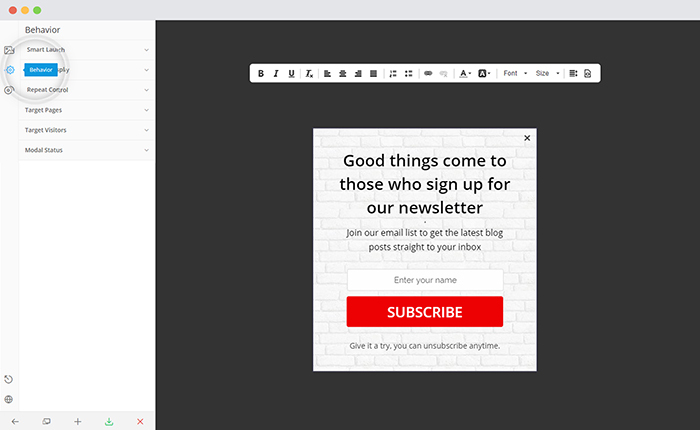 It’s flexible, easy to use, and allows your designer to style it to match your brand. If are looking for a free option, check out Contact Form 7. It’s not as easy to use or as flexible, but it is free. A well-designed website for a consultant helps you interact with potential clients. Using contact forms that allow readers to submit information to you is one of the first steps to moving away from a “brochure website” that does nothing to help you start and build relationships. ConvertPlug is the perfect tool for creating pop-up opt-in modules for your website. Pop-up opt-in modules are fantastic for boosting your opt-in conversion rate. Growing your email list is much easier using a plugin like ConvertPlug. ConvertPlug allows you to create different types opt-in modules. You can trigger them in different parts of your website. You can have modules that pop-up, slide in, and even ones that you insert in the middle of your posts or pages. The best thing about ConvertPlug is that you can create as many modules as you please. You can create ones specific to each post or page. The more specific you can make your lead magnet to what interests your readers, the more conversions you will get. You can offer many different lead magnets at different points on your website. You can also disable certain opt-ins on certain pages where it is appropriate. ConvertPlug is an excellent tool for creating high-converting opt-in modules throughout your website. Optin Forms is a fantastic free plugin that helps you create inline opt-in forms. The more opt-in forms you integrate into your website (without being intrusive), the more leads you will get. Optin Forms is perfect for your primary, email opt-in that goes on your homepage or sidebar. It only takes a few fields (name and email), so it’s ideal for a simple form that you want high conversions with. I use Optin Forms for the primary CTA on my homepage that introduces visitors to my free mini-series. It’s the first CTA that each visitor sees when they come to my website. You can also use Optin Forms to create a consistent form at the bottom of your pages or posts. Inserting a CTA for your email newsletter after each blog post can boost conversions. Readers who enjoy your content and have read through an entire blog post are more likely to subscribe. If you are looking for a simple opt-in module for your main CTAs, check out Optin Forms. Throw it on your homepage or underneath your blog posts to boost conversions to your email list. Drift is a live chat tool, giving your website visitors a chance to chat with you live. Live chat tools are perfect for interacting with potential clients. They allow you to answer questions they have in seconds and turning them into leads. Drift has a free version. The Drift WordPress plugin is also free and makes installing it on your website easy. I like to imagine that Drift is a way to start a conversation at a conference or networking event. What’s would be the perfect qualifying question? If you could have every website visitor answer it, what would you ask them? Think about what that would be, and use that as your Drift opener. My first Drift message was horrible. I was using it all wrong. This opener got a lot of interaction, but 80% of it wasn’t related to what I offer. So I changed it according to the rule above. I got fewer responses with this — but the responses have been much better. Responses like “getting more leads”, where I can help. Using a live chat tool like Drift gives your readers an easy, seamless way of getting in contact with you. It’s a way to get back to your leads quicker and start relationships right away. The faster you can respond to a lead, the better your chance of qualifying them. Drift offers a free version and a WordPress plugin that makes it easy to install live chat on your website. Content Upgrades Pro allows you to insert “content upgrades” into your blog posts. As a consultant, you should treat each article as its own product. A free, low risk, information product designed to get your prospects to know you, like you, and trust you. Before moving on to your services, potential buyers will read your material first to verify that you are the real deal. Especially as a consultant, where buyers are paying for your expertise. As products, your articles are material that you update a few times a year. They are evergreen. They generate traffic over time. They bring potential clients to your website. They impress referrals. And within them, you insert your content upgrades. Each reader finds a specific offering related to what they’re reading. Example: Let’s say you’ve written an article on a specific problem that your clients face. A good content upgrade would be a whitepaper summarizing your research on the problem. Everyone reading the post would get a chance to opt-in to your email list to receive this specific bonus. If you treat each article like it’s own product, content upgrades will improve them. They will also provide a massive boost to your conversion rate. You can use the best lead generation tools, but if you don’t actually persuade visitors to interact with them, you won’t get any leads. How are you going to get website visitors to fill out your forms? What question will you ask them with your live chat module that generates a response? Which free bonuses will you offer with your opt-in lightbox? Are you able to balance the information you need from website visitors to the time they want to take to fill out your form? You’ll need to apply some salesmanship to get readers to take action. Keep your copy focused on how it will benefit them, and you’ll have a much higher conversion rate. There are thousands of tools that claim that they can help you get new leads. Many of them do the same thing. If your opt-in solution works well already, then stick with it. If you’re happy with your live chat, then just use it. No need to change if what you’re using works. I recommend the tools in this article because I use them on my own website and for my clients. I’m comfortable using them. They are reliable and get the job done. Switching to different tools that do marginally different things is a waste of time. It’s much better to stick with one set of tools, learn how to use them, and then maximize their effectiveness. If you have a WordPress website for your consulting business, and you aren’t satisfied with the number of leads you are getting with your business each month, look into using these tools to help you get more leads. Start with the free versions and see if it’s a good fit. If your designer finds them easy to use and they mesh well with your current website, use them to create contact with your prospects when they visit your website. What tools do you use for your website to get leads? Let me know in the comments below. If you’re looking for more strategies to generate leads for your consulting business, read my post on consultant website lead generation.